Salem, Mass - I have the distinct pleasure of writing about a wide variety of destinations. I started this gig as a Russophile, but I have since become the go-to girl for Boston and New England, and I'm doing my best to cultivate my expertise of more tropical destinations like Belize and Brazil. It's not immediately clear what these places have in common, but I suppose that's part of the fun. Every once in a while, my worlds collide. That's what happened today when I was in Salem, Massachusetts, researching the new edition of LP's guide to New England. Salem has many highlights, one of which is the excellent Peabody Essex Museum. 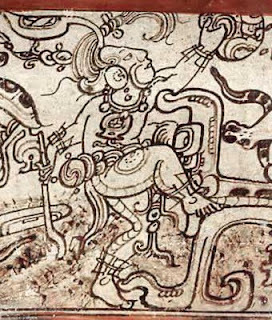 And right now, the PEM is hosting a pretty awesome exhibit on the "Maya and the Mythic Sea". The ancient Maya thrived throughout Central America from about 2000BC to AD1500. Their realm extended across Mexico, Guatemala and - drum roll - Belize. One of the thrills of visiting Belize today is exploring the myriad mysterious ruins left behind by this great civilization. Click to read about my experiences at Tikal in Guatemala and various sites in Belize. The PEM exhibit compiles artefacts from all across the region, the common theme being that they all offer insights on the Maya connection with water and the sea. So you've got the figurine of the Jaguar God of the Underworld riding a crocodile; a Maya deity peeking out from through the toothy grin of a spiny lobster; many depictions of the rain god Chaahk; and (my personal favorite) a 10-pound jade sculpture of the head of the Sun God, which was excavated at Altun Ha in Belize. But most of these artefacts are not on display anywhere in Belize. 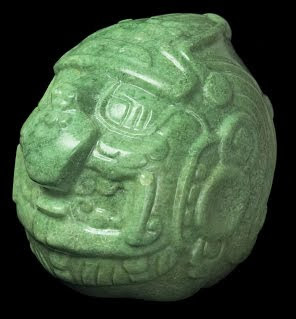 Maybe there are museums in Mexico or Guatemala, but Belize has no facility to protect and present these ancient, intriguing pieces. So the PEM exhibit is a real treat.